When you travel, what would you like your travel destination to be? For me, I would like it to be like a “one stop shop”. It’s good if you can really do a lot of stuff in one place because 1) It makes your trip, especially if it’s a long trip, worthy and 2) There will be no dull moment because you would be busy experiencing everything in just one place. Now, that’s what Jeongdongjin can offer to its visitors. Jeongdongjin is located in Gangneung, Gangwondo, South Korea and it has a lot of things in store for the locals as well as for the tourists. 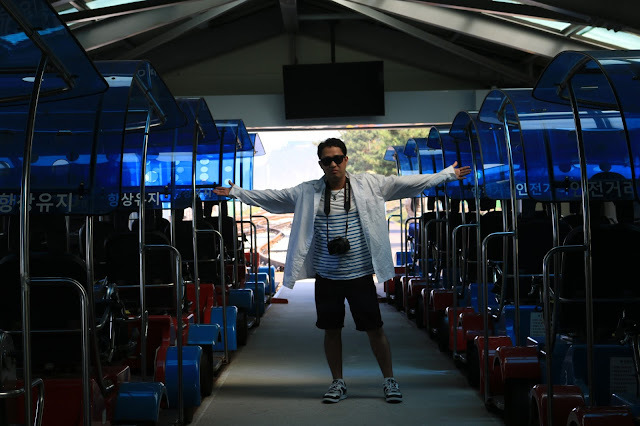 We visited the place as part of the itinerary of Goh Travel Korea, a travel group I joined in. For the first part of our trip, you can check our visit at the Sheep Ranch at the nearby place in Gangwondo. At Jeongdongjin, the first thing that you would notice is the smell. It smells like the ocean. The air, the cool breeze, the sound and the feels, you know and you will never be wrong that there’s a sea somewhere in the area. True enough, the white sand and the big waves of Jeongdongin Beach welcomed us as we arrived in the area. I kid you not, and I have to be honest, that this is the best and the most beautiful beach I’ve ever seen in South Korea. 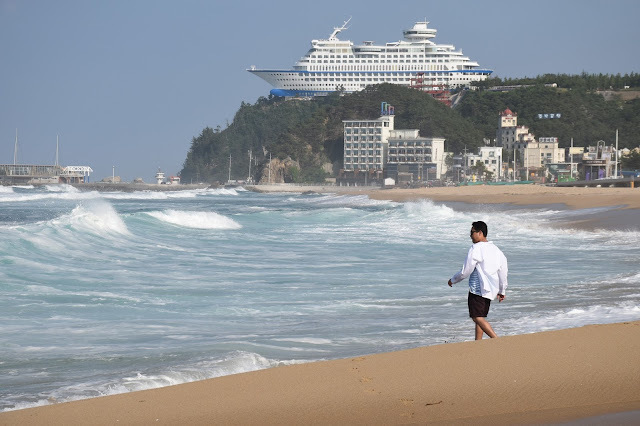 I always said that Korea is not really popular with beaches. Seeing that I came from the Philippines where you can find the best beaches in the world, I could not be easily pleased with the beaches in South Korea, but Jeongdongjin beach, oh man, this is so awesome. Added to the attraction is this ship like hotel constructed at the top of the hill. Whatever you’re doing in the beach, whether you’re sun bathing, swimming, or just viewing, you can’t help but notice this beautiful architecture. I mean, who would build a hotel on top of the hill, and what’s ironic? It’s in the form of a ship. But I guess it works. It’s nice to look at and we really admire it. Although we were thrilled and we enjoyed the beach despite the fact that we didn’t really swim, the beach is not just the only thing you can see at Jeongdongjin. We also tried the rail biking. I’ve tried rail biking before at Yangpyeong, but it’s a different set up at Jeongdongjin because the railway is located right next to the beach. We bike our heart out in the railway with the beautiful view of the sea and the cool breeze. It was summer when we went there, the sun was up and high, but we’re not really intimated because we enjoyed the air from the sea while we do biking. The rail bike is operated with a battery and we had to pedal at the beginning just to start it up, so after a few aerobics on the pedal, we let the batter do its work to make the bike run and we just rod, relaxed and enjoyed the moment. If there’s a railway for bike, there’s also a railway for the train. The Jeongdongjin Station is located right in front of the beach, so people can ride a train from anywhere in South Korea up to the Jeongdongjin Station and when you get off, welcome to the beach. I think, if all train stations are like this, I would not mind waiting for my ride because you wait with the view of the sea and air blowing right through your face because the beach is literally one tumbling away from Train Station. It’s so close that the station even made it to the Guinness World Records as the closest train station and tracks to a beach. The station is on the Yeongdong Line of Korail. If you want to go here from Seoul, you take the train from Cheongnyangni Station, it takes around 5 hours to travel from there. I heard that people go to this place because of the Sunrise. There’s actually a Sunrise Park in the area but since we went there at the midday, obviously we were not able to catch the sunrise. As what they’ve said, sunrise is very popular in the area. People especially the travelers sometimes intentionally travel from Seoul at midnight, and when they arrived at Jeongjongdin Station at dawn, not only the beach will welcome them but also the most beautiful sunrise in all of South Korea. I like how there are a lot of cafes, restaurants and stores in the area too. It makes traveling to this place easier. You will surely never go hungry when you go to Jeongjongdin. People are also selling variety of seafood like dried squids. And people there are extra friendly to foreigners. If you are looking for a travel destination this summer, you might want to consider the Jeongjongdin. It is far from Seoul yes, but it’s all worth it. We have never been here, but it looks quite interesting! That boat hotel is unique looking. I was also surprised by the size of the waves in your photos. I can't believe I didn't take the time out to visit this resort. If it rivals the white beached of Philippines, then it must be extremely nice! I guess a year and a half in Korea wasn't enough. I didn't realize the rail bikes were also in there. I hope I make it back someday. Thanks for sharing. When I was planning for our summer vacay last year, I was torn between Sun Cruise Resort and Alpensia. I didn't regret going to Alpensia because it was such a lovely place but always seeing photos of this boat-shaped resort always makes me want to go there. Lucky you! It seems like everyone is going to Gangwondo lately. I still haven't been. I need to get out of Seoul more. It's a bit suffocating sometimes to always be in a big city. This place looks like my dream destination. I really want to go there at sunset and take a picture of that boat hotel. And railbiking at the beach? Sounds awesome! This looks like a cool place- there seems to be so manu hidden gems in the Gangwon province! I have wanted to try rail biking for a while, looks so fun! I've been here as well and loved it! I really liked rail biking when I lived in Korea. I think my favorite was in Chuncheon. They call it the "Switzerland of Korea" and the rail bike path was really gorgeous. Thanks so much for sharing! The rail bike by the sea looks so peaceful and serene. I would love to have a go at it with my boyfriend! This is probably the first post I've encountered on Jeongdongjin. I was going to ask if that was a ship or hotel but you answered that ;) And I would love to take a train ride that close to the ocean... so cool! I also love the idea of a 'one stop shop' destination, especially when you don't have alt of time. It looks like Jeongdongjin has it all! And that rail bike looks like so much fun. it is the highest and southernmost town in Somerset, England and well worth a visit. No less than three stations and two Station Platform companies have served Chard. Not bad for a small somerset town but unfortunately they have all been closed. Railways bring up memories of the past for most of us and I believe this is where much of the passion and excitement model railroaders have comes from. There are thousands and thousands of people who collect model railway scenery in fact model train and railroad collecting is one of the most popular hobbies today. Don't be fooled though, you don't need to be an expert craftsman or an experienced model railway collector to start admiring and collecting these amazing models. Everyone has to start somewhere.